Killed in Action at Ancre on Monday 13th 1916 aged 35. William Herbert Jones was born in Llay Hall to parents who were also born in Llay Hall – Thomas in 1846 and Hannah in 1848. It is probable that Thomas worked at Llay Hall Colliery near Cefn y Bedd, west of Wrexham. The colliery was sunk by the Llay Hall Coal, Iron and Fireclay Company in February 1877. It was on a large site which originally featured a wire mill, colliery and brickworks. In 1881 two men and ten horses were killed in an explosion at the pit. The colliery lasted until 1949 while the brickworks closed in 1975. It is unclear when or where Thomas (a collier) and Hannah were married but in 1879 they were living in Darwen, Lancashire. Darwen was a cotton mill town near Bolton in the Lancashire coalfields, and the mines supplied the fuel for the mills. William’s elder sisters Lily and Harriet were born there. The younger children were born at Llay Hall (? Llay Hall Farm or Llay Hall Cottages). On 20th December 1880, when Thomas’s daughter Harriet was baptised at Gwersyllt Church the family lived at Wiremill, which was behind the New Inn at Gwersyllt (close to Llay Hall Colliery). On 17th January 1881, when Harriet was buried at Gwersyllt church, the family lived In Cross Street, Gwersyllt. By April 1881 the census showed that the family lived at Station Road, Gwersyllt (village of Wheatsheaf), Denbighshire. In November 1887 when 3 year old Mary and one year old Minnie were baptised at Gwersyllt Church the family was living at Llai Hall Houses, Llay Hall, Denbighshire. They were still there when the youngest child, Thomas, was baptised. By 1891 the family lived at Colliery Houses, Gwersyllt, and therefore it is probable that Thomas worked at the Gwersyllt Colliery. In 1896, the Gwersyllt coal mine, in operation since at least 1881 and owned by Edward Griffiths, had 185 employees with 167 below ground. In 1901 the family was living at Ffrwd Cottages, a few doors away from the Red Lion Inn (now The Ffrwd). This means that it was likely that Thomas senior was a collier at the Ffrwd. At this point William was a 19 year old miner. In 1902 James Sparrow, the owner of the Ffrwd mine, died and in 1904 the mine closed. By 1911 William was living at 3 Rose Cottages, Ffrwd, and he was described as a collier but as the local mine was closed it is unclear where he was working. William was 29 and unmarried. He lived with his eldest sister Lily who was 32 and unmarried. Also living with them was a nine year old boy, Bertie Jones, who was described as the son of the head of the house. No other reference to Bertie has been found so his identity remains something of a mystery. By 1911 there was no sign of William’s parents and it is likely that Hannah had died in 1907 and Thomas in 1909. 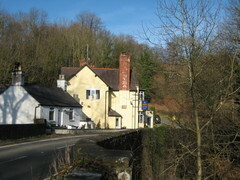 The Ffrwd, previously the Red Lion Inn, Ffrwd. William was still on the electoral roll in Ffrwd in 1915. Records of his enlistment and army service have not been found but his approximate enlistment date can be estimated using his regimental numbers. 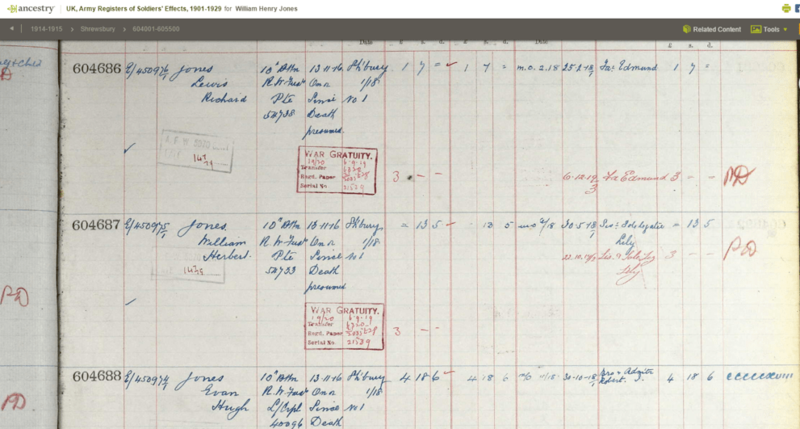 His medal roll card gives two regimental numbers for his service in the Royal Welsh Fusiliers – 4601 and 54733. The 4 figure number is likely to be a 5th Battalion RWF number, allocated mid 1916 so it seems likely that this is when he was called up. Following the losses on the Somme in the summer of 1916 a large amount of infantry men were posted to France from the second line Territorial units based in the UK. They would be posted to an Infantry Base Depot in France under their Territorial number. From there they would be allocated to the various battalions in the field and, at this stage, because they were moving from the Territorials to the ‘Regular’ they were renumbered to the ‘Regulars’ number series. In RWF they are mainly 5xxxx numbers. This was formed on 16.09.1914 at Wrexham as part of the Third New Army (K3) then moved to Codford St. Mary, Salisbury Plain to join the 76th Brigade of the 25th Division and then moved to Bournemouth. 29.04.1915 Moved to Romsey and the Barrosa Barracks, Aldershot. 27.09.1915 Mobilised for war and landed at Boulogne. 15.10.1915 Transferred to the 76th Brigade of 3rd Division and engaged in various actions on the Western Front. In 1916 the battalion saw action at the Bluff and St Eloi Craters, the Battle of Albert, the Battle of Bazentin, the Battle of Delville Wood, the Battle of the Ancre. This was the final large British attack of the Battle of the Somme in 1916 before winter. The attack by the British forces was planned for a few months and cancelled many times but it was decided that the attack should begin on 13 November, if the weather stayed dry. A draft of 47 men joined the 10th Battalion on 6th November whilst the battalion was out of line. They went into the line on the evening of 12th November under orders to attack and hold four lines of German trenches in front of Serre. The following morning, Monday 13th November, the day of his death, the weather was dry and dull. The attack commenced at 5 45 am. He has no known grave, and is commemorated on the Thiepval Memorial. William’s elder sister Lily had been named as next of kin, and was the sole legatee (recipient of his war gratuity). The record of his War Gratuity entitlement (below) shows that this amounted to 13s 5d in May 1918 and £3 in October 1919.